You’ll love baking a batch of Easy Gluten Free Peppermint Blossom Cookies this holiday season. That’s because this easy recipe can be quickly made from ingredients you probably already have in the pantry or can quickly pick up at the store. I love baking holiday blossom cookies for cookie exchange parties since they’re so pretty and festive. I wanted a Hershey blossom cookies recipe that’s gluten free, since so many people are on gluten free diets these days. But no need to worry if you’re baking for folks who aren’t gluten free. These Easy Gluten Free Peppermint Blossom Cookies are so yummy that no one will notice that they’re made with gluten free ingredients. This easy blossom cookies recipe is super convenient, too! You can cook up a batch of holiday blossom cookies after dinner. Or if you don’t mind waking up 40 minutes early, you can bake up some Easy Gluten Free Peppermint Blossom Cookies in the morning before going to school. You can easily convert Easy Gluten Free Peppermint Blossom Cookies into a dairy free blossoms cookies recipe (see the tips below), if there are any dairy free folks you are making cookies for, as well! 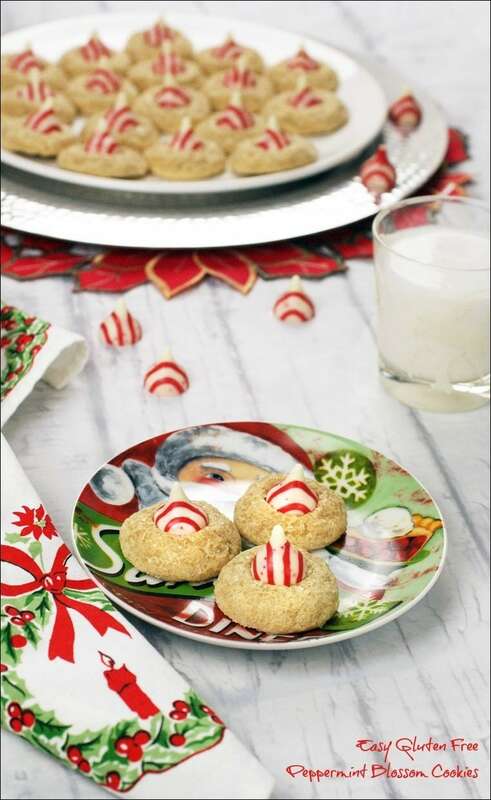 Peppermint blossom cookies are so much fun for the Christmas holidays with the addition of a Hersheys Candy Cane Holiday Kisses in the middle. I always have candy dishes around with Hersey’s Kisess, but I adore the striped mint ones. They’re so pretty! However, all chocolate kisses – dark, regular and white chocolate, do contain lactose, which is a milk sugar, i.e., dairy. So beware if you have a food sensitivity to dairy. If you’re baking a batch of these easy blossom cookies for someone who is has to avoid milk products, remember the dough is already dairy free. Instead of using Hersey’s Kisess, add a square of dairy free dark chocolate in the middle as a dairy free alternative. Or you could turn the Easy Gluten Free Peppermint Blossom Cookies into gluten free thumbprint cookies by adding a dollop of cherry or raspberry jam in the middle instead of a chocolate kiss. All three ways, these gluten free and dairy free easy blossom cookies are divine – soft, moist and buttery with a bit of crunch from the sugar on the outside. Plus you have a festive cookie that’s perfect for holiday cookie swaps and Christmas parties that can be made in less than an hour (including cool down time). Don’t forget to save a few for Santa! My favorite gluten free flour for cookie baking is Bob's Red Mill Gluten Free 1 to 1 Baking Flour. I always get great results with it. I used Bob’s Red Mill Decorative Sparkling Sugar to roll my cookies in. I love the big sugar crystals and how they made the outside of my cookies a bit crunchy! However, you could use colored sugar crystals. Again, get creative and mix it up! I used unsweetened coconut milk, but you can use any type of dairy free milk you wish. However, some people have allergies to soy or almond milk, so I feel coconut is the safest one to use. Many kids don’t like coconut, but so little is used, you can’t taste it. 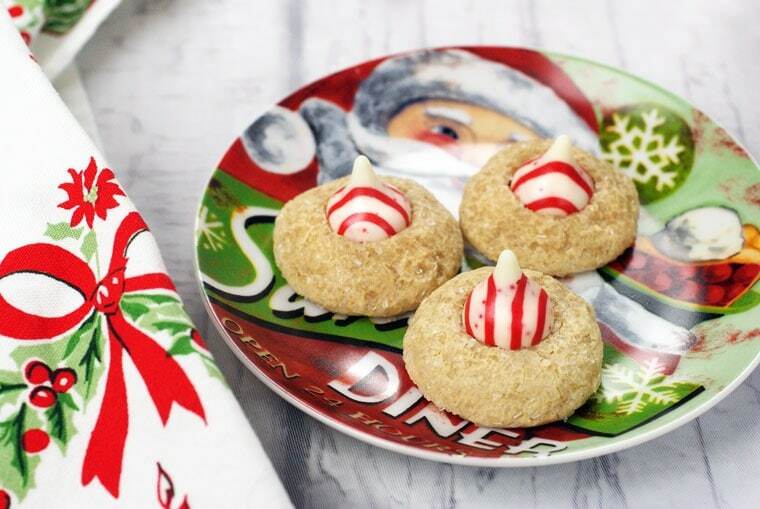 While I used Hershey Candy Cane Holiday Kisses in this batch of easy blossom cookies, you have the option of using dark chocolate, milk chocolate or any variety of Hersey’s Kisses you like. Mix it up and have fun! Easy Gluten Free Peppermint Blossom Cookies make a wonderful edible holiday gift for teachers, school bus drivers, grandparents, coaches or friends. These festive blossom cookies aren’t just for Christmas. Change the colors and candies for any holiday on your baking list! Mix buttery spread, brown sugar, egg, vanilla, and coconut milk in a large bowl until well blended. In another bowl, stir together Gluten Free 1-to-1 Baking Flour, baking soda, and salt. Add flour mixture to butter mixture a little at a time. Mix until well blended. Poor sparkling sugar on to a medium sized plate. Using a small ice cream scoop, measure out dough into enough for a 1-inch ball. 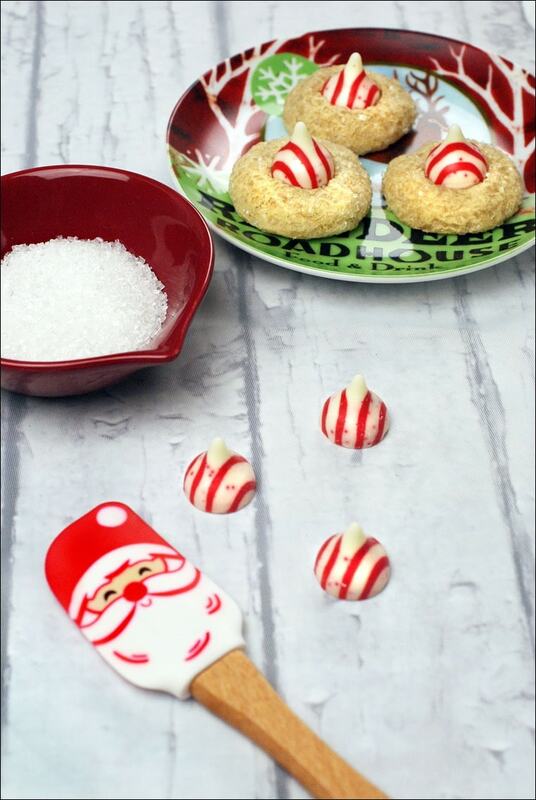 Roll ball in sparkling sugar and place cookie on a baking mat on a cookie sheet. Bake cookies for 8 minutes or until edges have browned slightly and the cookies have set. While cookies are baking, unwrap candies. Remove cookie sheet from oven. Cool cookies for 2 minutes. Gently press a chocolate kiss into the center of each cookie. Using a spatula, carefully move cookies to cool on a wire rack. Originally posted on December 10, 2015. Updated with new pictures and information. 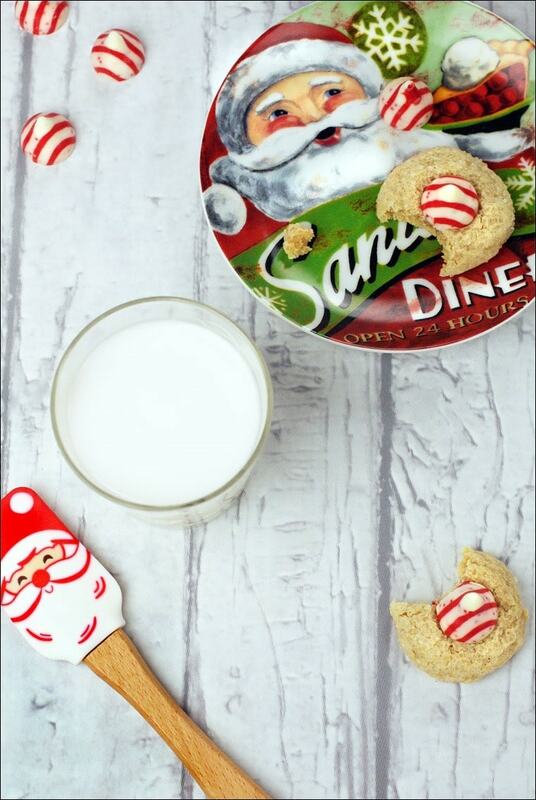 Posted in Baking, Christmas, Desserts, Gluten Free, Recipes and tagged cookies, dairy free on November 29, 2017 by Anne-Marie Nichols.